You are here: Home / Blog / Humidifier VS Vaporizer – Difference And Which is Better? If you don’t understand the difference between a humidifier and a vaporizer, check out my guide here. Simply put, the humidifier is either a warm or cool mist emitting machine, while the vaporizer is a warm mist humidifier. For a person who suffers frequent colds, nasal congestion, nosebleeds and allergies, a vaporizer or humidifier in the home is heaven sent. By using one of these two home appliance, you can easily relieve the symptoms. Although these machines have the same goal of increasing the moisture level in the air and thus providing symptomatic relief, the debate of vaporizer vs. humidifier in terms of effectiveness has been going on forever. Honestly, one is just as affective as the other; each has its advantages and disadvantages as well. In colder climates, and especially when a heater is used, breathing can be more difficult and uncomfortable because the air becomes too dry. Using a humidifier can easily restore the moisture back into the house by releasing a cool mist into the air. On the other hand, a vaporizer is used for the same thing but by releasing hot vapor into the air. There is a heating elements inside the machine that heats the water and then releases hot steam. 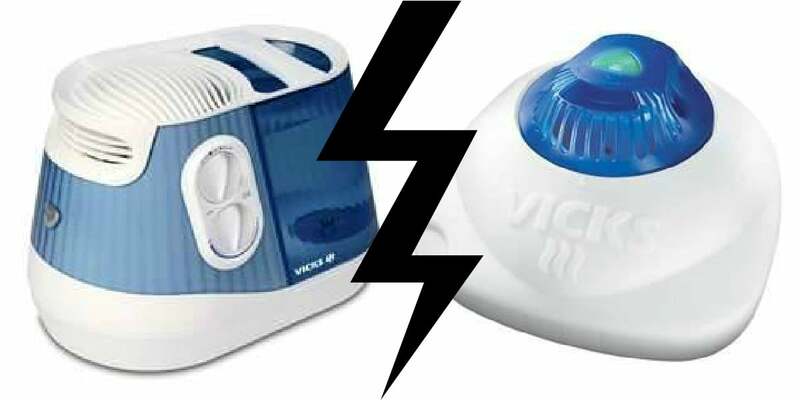 In the battle of vaporizer vs. humidifier, humidifiers score one point for being the cheaper alternative. This is because humidifiers do not have any heating elements and thus no cost of heating the water. However, because water is boiled in a vaporizer, there will be zero bacteria and specks of mold released into the air. With a humidifier, there is a higher chance of bacteria and mold growing inside your home. You can prevent this, however, by cleaning the humidifier with soap water every now and then. On top of eliminating bacteria and mold particles, the boiling water also deactivates any natural minerals contained in the water. These natural minerals can cause mineral building up on the surfaces of and react to your furniture and home finishing. Worse, it can be harmful to the health of the people in your home and also to your pets. If you already have a humidifier and is terrified of this, you can opt to use distilled water with a humidifier. Safety wise, humidifiers have the upper hand over vaporizers. Because a vaporizer will always have heated water inside it when used, it can be hazardous. Should you put a vaporizer inside your small child’s room, she may play around the machine and put her face on the steam and hurt herself. The hot steam can also be harmful to curious pets roaming around the house. Therefore, in this case, a humidifier is the better choice. As you can see, it’s a tie between vaporizers and humidifiers. Despite the whole vaporizer vs. humidifier thing, both water reservoir should be kept clean by washing them with disinfectant soap at regular interval to lessen the possibility of bacterial and mold growth. And also to clear the air (pun intended), a warm mist humidifier is ultimately a vaporizer and a cool mist vaporizer is a humidifier. In the end, you should decide which is best for your home and needs. You should consider the weather (humidifiers are best for warm climate as the warm mist from vaporizers will make you uncomfortable) and also any small children or pets at home when you decide to get any one of them.